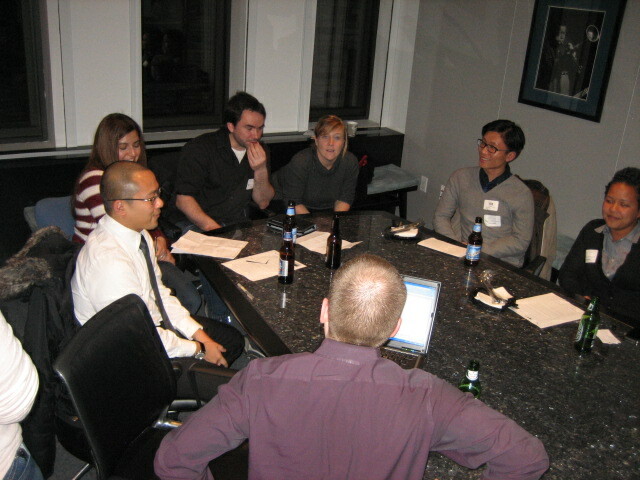 We had another great user group last Thursday evening in NYC! Thank you to all of the NY users, developers and partners who could attend. There was a lot of great discussion around the YouTube sync feature and HTML5 enhancements that we presented on during the event. Brightcove customers who attended the user group were also able to voice their opinions about which of the features we are considering for our HTML5 players are most important to them, by playing a quick product planning game. The room was divided into two teams and each team was allocated a certain amount of money that they could "spend" on the features that they wanted to "buy" (have) most. It was very interesting to hear the conversations that occurred among team members while they were deciding on how to prioritize each one! We especially want to thank EMI Music for hosting the event and for doing a great 'show-and-tell' on all the awesome ways they use Brightcove! If you are a Brightcove user in the NY area and haven't joined our community yet, click to sign up today! We are already looking forward to our next New York user group and will share the details on LinkedIn as soon as they are available! If you have any questions about our User Group events, or would be interested in hosting an upcoming NYC User Group meeting, please email: community_manager@brightcove.com! If you would like to join one of our other local Brightcove User groups on LinkedIn, you can check them all out here!